Hard to believe it’s been almost a month since my last post. 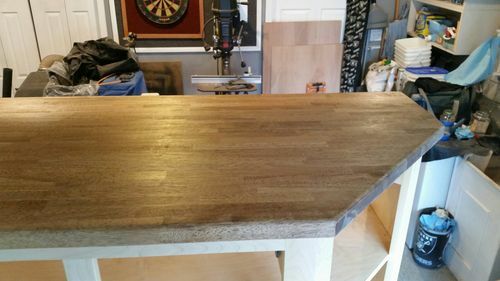 I didn’t get as much shop time as I hoped through the holidays. Working for a shipping company, I ended up working the holidays because of extra flights and work assigned to the Aircraft. No complaints though, it allows me to buy tools…It’s why we work right? 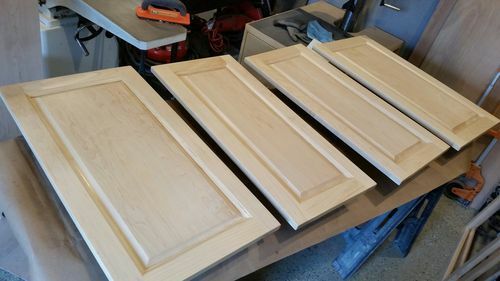 The panels of the doors got a 50/50 mix of seal coat and denatured alcohol and lightly sanding with 220 grit, then stain before assembly. We came up with a color Blondie liked after many tests. Ended up with 2 parts pickerd oak & 1 part cherry. She wants it to show the grain of the maple with a slight golden tone. 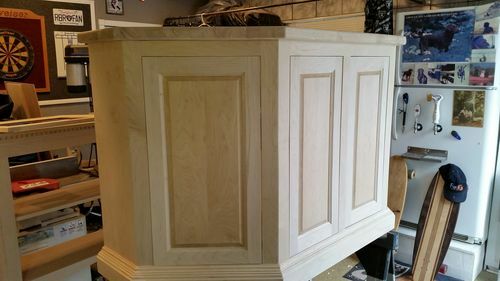 With whitewashed maple cabinets in the kitchen she wanted something close, but different as well. To me that’s a funny statment. It’s like we have the same cars however mine is a Chevy yours is a ford.. Being I choose soft close inset doors that took more time to get fitted and adjusted. Overlay doors is so much faster. As my pops says, “the fussy work”...love that saying. 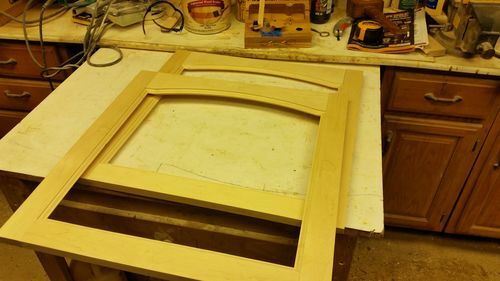 Once I fitted took doors took the hinges back off and sanded doors and cabinet to 320 grit. We all love sanding right? Ugh…...Sprayed seal coat & stain on the base inside and out as well. Today I’ll start spraying the lacquer on the base. Blondie decided for a little, contrast on the bases counter top. I used 50/50 of provincial and mahogany stain. I was nervous about his but in the end I think it gives it some visual interest and just enough contrast. The walls in the kitchen are dark brown. Blondie hates white wall, says they’re boring. We know who is in charge right? Lol…. 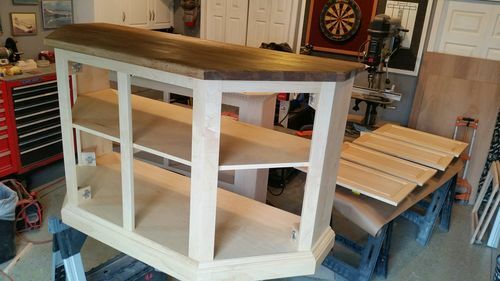 Some final sanding on the top and cuttinfg & tweaking of the 2 glass doors, then I’m ready to seal coat and stain as well. Finally feel like I’m getting there. Thx for looking all comment welcome. Glad you made it through the holidays OK.
Making very good progress on your cabinet! Beautiful! I think the Mrs. made the right choice with the top color. Looks like you’re having a great time and doing a craftsman’s job on this project. I like to build with others. We do it their way on their project and my way on mine. LOL! And you guys are doing it the customer’s way. And she is after all your best customer. My wife loves to irritate me by saying “we could paint it?” Just a matter of perspective? Wow, great looking piece and you know the old saying happy wife, happy life! Looking really nice. Yes, time is screaming by. That is really looking classy. I got the bottom Sprayed with 5 coats of lacquer it’s really looking better with the finish on it. Look’n great! Can’t wait to see the finished product! Looking real good Ken…even the fussy work! 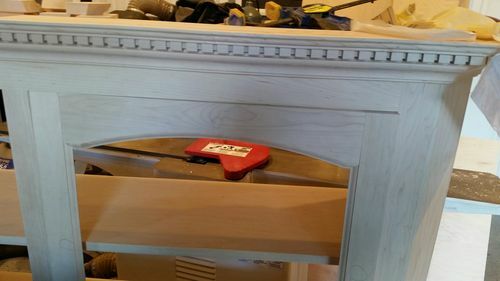 Looks wonderful Ken I can’t wait to see the finished project.